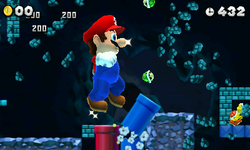 World 1 is the first world appearing in New Super Mario Bros. 2. 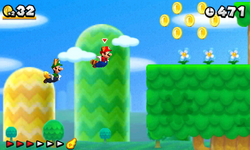 This world is a grassland world similar to many other Mario sidescrollers in the series. 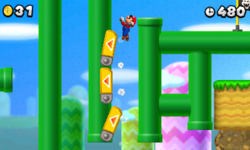 The map music in this world is the same as that of World 1 of New Super Mario Bros. Wii. 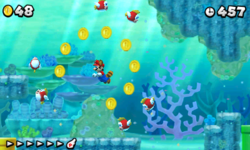 This world is a compulsory world, meaning it is necessary to play before defeating Bowser in World 6, since this is the first world of the entire game. 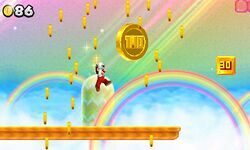 There are ten levels in this world, seven are on the main path, one is an optional level, and the other two are the rainbow and cannon levels of the world. 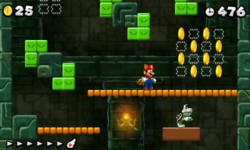 The seven levels on the main path includes five normal levels, the Fortress and the Castle. Other than the ten levels, there are also four Toad Houses in this world. This includes two red ones and two green ones. 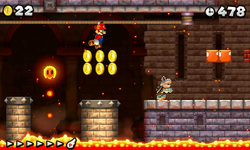 The boss fought at the castle is Roy Koopa. 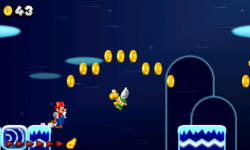 Completing that castle leads to World 2, while the cannon takes Mario to World Mushroom. This page was last edited on June 25, 2017, at 17:45.